Good design should stand the test of time. Here’s one of my favorite projects I completed before working at ODADA. I renovated this Victorian home in Noe Valley. The design direction was to create an easy and sophisticated environment to welcome a world traveler home. After developing several design options, we took a medium-agressive approach: not a complete gut nor moving of walls, but a design in which all the unimpressive architectural detailing was eliminated, and an outdated kitchen and bathroom were gutted and redone. Built-in cabinets and lighting were used in almost every room to create a sense of space, and to allow free-flowing movement in a formerly dark and cramped space. The space still feels modern today. •color directs the eye and add a sense of spaciousness. By coordinating the colors of the kitchen and bedroom (making the latter a slightly warmer, more saturated color than what is in the kitchen area), your eyes travel from the dining table through the apartment to the back bedroom. The slightly deeper color tricks you into believing that the bedroom is further away. •mirrors also increase the sense of space. The entry mirror reflects the greenery outside, making the entry now feel like part of the courtyard vestibule. 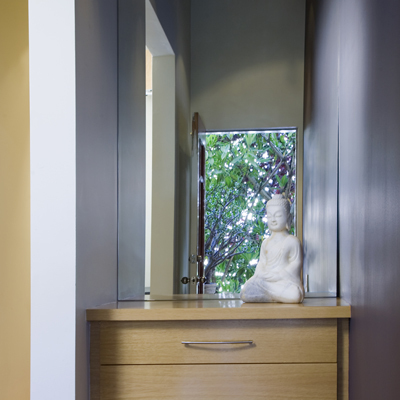 (To ward off any feng-shui issues, we placed the client’s buddha sculpture on the new entry cabinet. Now the space welcomes good energy only!). In the office, a large mirror was placed opposite the windows which are shaded by an overhead deck. The mirror reflects the light and view of the garden, and animates a space. •built-ins push living to the perimeter of the room, thereby fully utilizing every inch of space. Eliminating the clutter of stand-alone furniture also helps make cramped rooms seem larger. 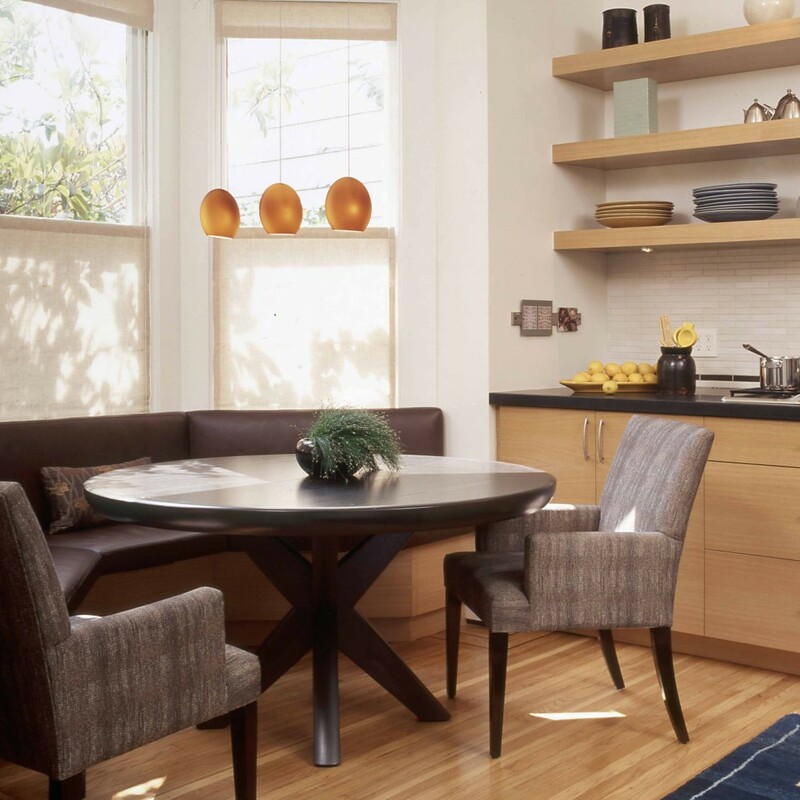 This also maximizes the function of awkward spaces, such as window sills and niches: these can become window seats for dining, built-in desks, or a wine bar. •deep color can add drama and interest to windowless spaces, such as small entries. Select a color slightly darker than you would expect. If you’re uncertain, paint several patches on the wall and observe shift in color throughout the day. •light colors don’t necessarily make small rooms feel larger. And if your room is dark in addition to small, you might be better off painting the room a deep, inviting color. Also consider painting the ceiling even darker, but in a finish with more sheen: any light coming into the space will be reflected on the ceiling. •customize existing furniture. An old tansu chest with a beat up top was given new life — a stone top to match the kitchen counter. This did not cost very much, and now the client has a beautiful serving area for when she entertains. Or repurpose an Asian cabinet as a night stand. Lots of storage, with no additional money spent. •Heath Ceramics tile still looks great in kitchens and bathrooms. Casual with a handcrafted touch. Now the entire city has caught on to this local resource.